Valentine’s Day is just around the corner, I know it will sneak up on me. Baby Girl is due to arrive just after this day of love. I’m trying to get Little Lady’s Valentines finished and a few decorations up so I can enjoy the next couple of weeks and try to relax. 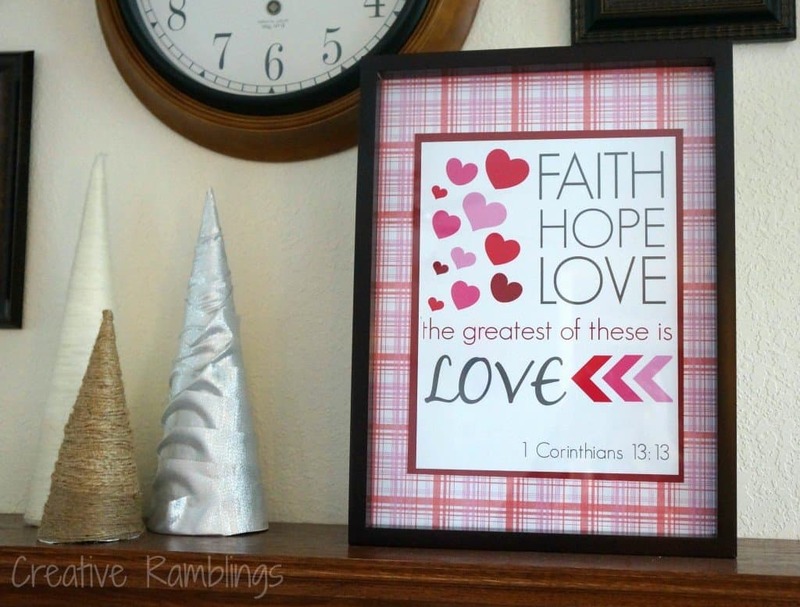 I chose to add a simple printable of one of my favorite verses, 1 Corinthians 13:13, to my winter mantle to brighten it up a bit. When I decorated my mantle late last year I went with a silver and winter white theme so I could leave most of the items up for a couple of months. I added this simple framed print for Valentine’s Day with 1 Corinthians 13:13 and it blends nicely. This will probably be the only decorating I do but it brightens my living room just enough. I used a frame I had on hand and some red and pink scrapbook paper to mat this print I created. 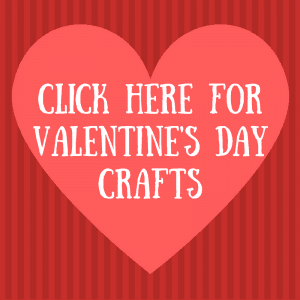 Colorful printables and scrapbook paper are an easy and inexpensive way to decorate. I used framed kitchen towels to decorate my eating area! These can be changed out each season to bring new colors to your room. I love all of 1 Corinthians 13, it’s such an inspiring chapter. This is one little verse that is fitting for the season. 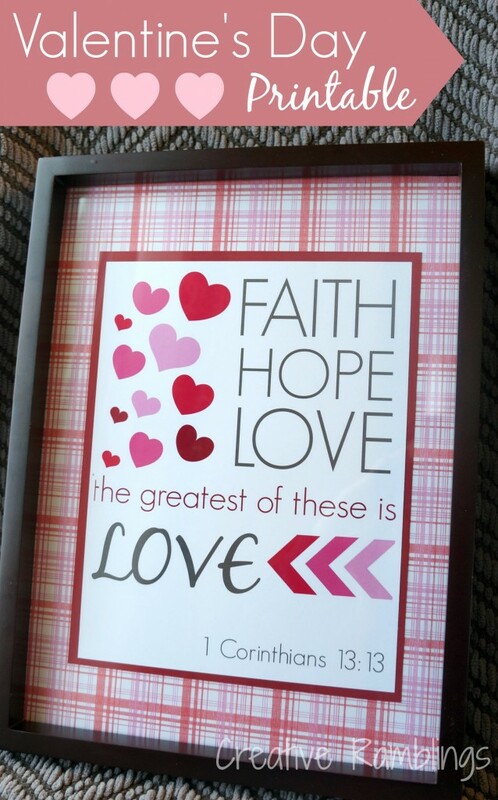 You can download your own copy of this 1 Corinthians 13:13 print by clicking on the picture below. Pair it with some colorful scrapbook paper to decorate your home. If you like this, I invite you to pin it. This is so cute, Sarah! That’s one of my favorite verses and what a great time of year to share it. Mine to Carrie, it fits well with Valentine’s Day too. Thanks Diana, excited to be part of party #1. Hey Brittany, so glad you like it. And thanks for following along! Great printable – can’t wait to add it to our clip board wall. Thanks for sharing! Pinned and shared. Very beautiful! Thanks Jane, so glad you like it. Baby will be here soon and yes I’ll be sharing! Have a great day. Thanks Judy, I’ll check it out. 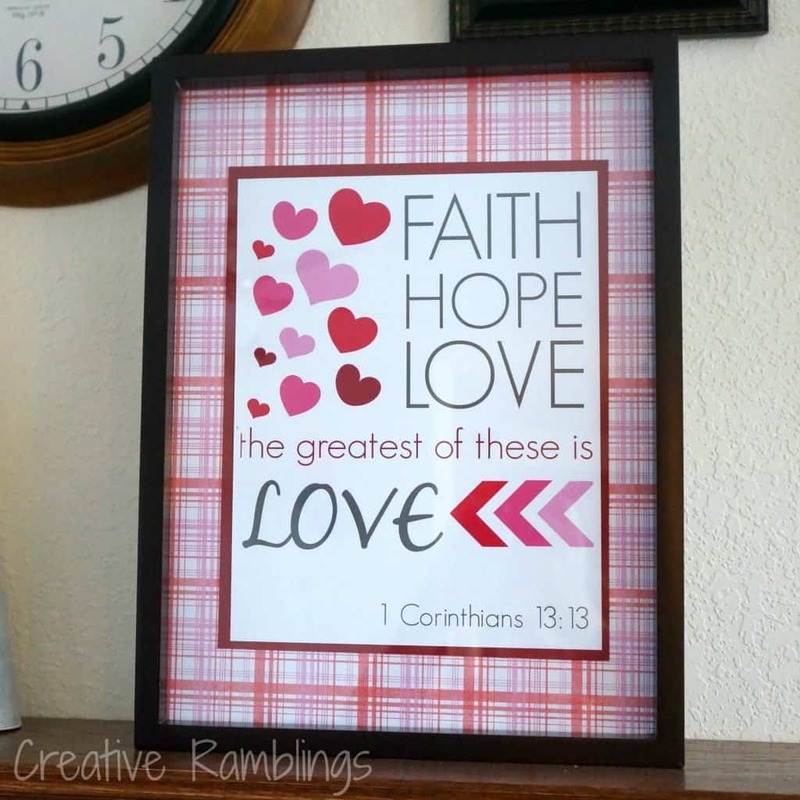 Aww this is one of my favorite verses, thank you for the printable!